Supports multiple sports or clubs. Make reservations by just a few taps on your mobile device. Find players to form a team without typing a word. Clubscaddy is a zero-footprint, cloud-based application that you can simply access through the Web without the need to install the software on your computer. Its mobile apps are written using native iOS and Android SDKs with a rich responsive UI. The App caters to the needs of two main personas; members and administrators.The club setup is fairly easy. To add your club to the ClubsCaddy catalog, we need the following details from you. Reservation rules per sport such as maximum hours a member can reserve time per sport, per day. List of all members with their name,gender, email, phone number and sport. Afteryour club is added to the ClubsCaddy catalog all members of your club will receive an email notification with their login details. They can download the Clubs Caddy App from App store orGoogle play.They can login to the app with the provided credentials or through Facebook Login and start using the app. Yes, it is that EASY! 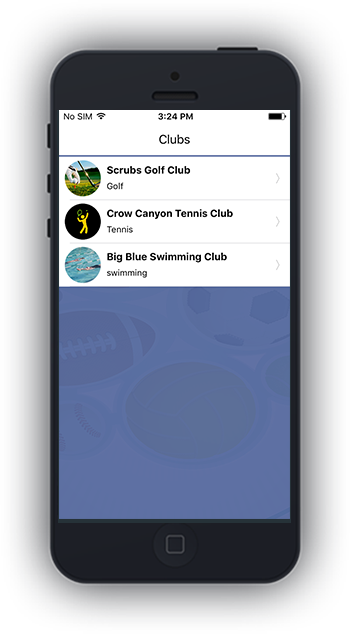 Members who play multiple sports can access the app features for those sports as long as their club is part of the catalog. 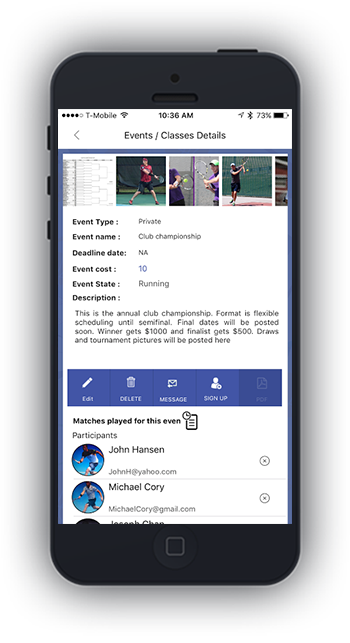 They can switch between clubs within the same app.For example, if a member plays Golf and Tennis at a club, he can easily access both sports as long as his club is listed in the ClubsCaddy Catalog. Your club administrators can access everything on an iPad or Android Tablet instead of using bulky desktop at the front desk. However, if you already have a computer, you can continue to use it to access the ClubsCaddy web interface. Simply login to the website’s customer portal to access all the app features. You must be thinking: there are several applications out there for court reservations, why do we need another one? What is so special about Clubs caddy? For starters, we use a native app that is designed for Android and iOS, something all the other online reservation systems lack. 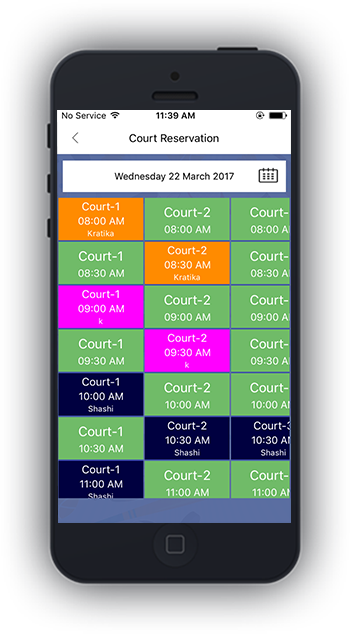 The ability to book courts from your phone with a couple taps of your screen saves untold amounts of time for directors and members alike. Additionally Clubs Caddy comes equipped with a myriad of extra features that you soon won’t be able to live without! Administrators, captains and coaches typically require several applications to manage tournaments, classes, leagues, etc. 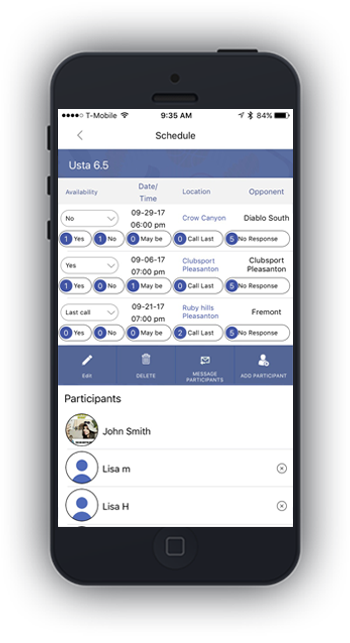 Clubs Caddy allows you to do all those things plus more in one easy-to-use mobile app. We put together a one-of-a-kind platform that is feature rich and addresses every need of a modern club. When you compare us to the other programs out there, choosing Clubs Caddy becomes no brainer! Members can easily add, view, and cancel reservations. Reservations are added to your personal phone calendar with the default reminder set to 60 minutes before the reserved time. Administrators can manage reservations for all club users including members. If they cancel an existing member-created reservation, then the affected member is notified of the change. They can override reservations based on club needs. They can edit an existing reservation by removing some slots from it too. Block reservation enables administrators to block reserve multiple slots for one time use. Recursive reservation enables administrators to reserve multiple slots repeatedly for a set number of days, weeks or months. 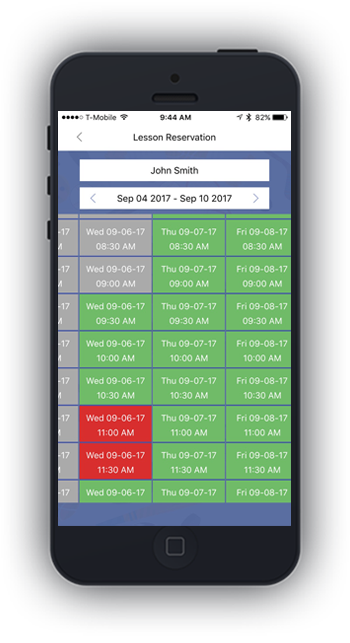 Administrators can delete a member-created reservation for not showing up at the set time but can also keep tabs on no-shows by marking it as a NO Show in the app. Members and administrators can create groups to communicate with specific categories of users. Match maker, Broadcasting and Polling features use groups for communicating to specific set of users. Create a group of users and assign them to a group with a unique name. Groups are only visible to users that create them. Add or remove users from a group. Match maker is a powerful functionality in ClubsCaddy to help teams fill up available player spots quickly for an upcoming game or practice. Instead of sending texts or emailsto a bunch of people,then waiting and sorting through their responses to fill a team, you can send a match maker invite to a specific group to join. Imagine you want to play tonight at some time but don’t have enough players to play with. Fortunately there could be some others in your group in similar situation. Match maker lets you send invite a group to setup matches or fill up a team. 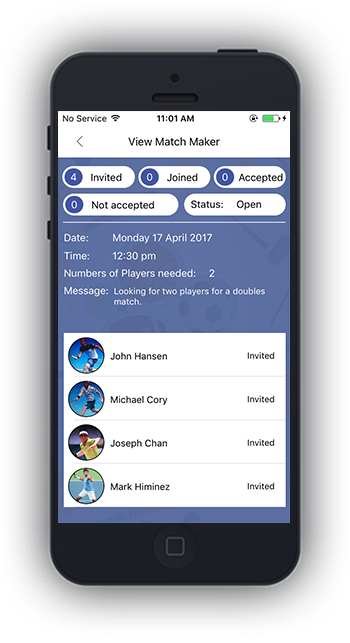 Match maker invite requires you to provide the date, time, venue and number of players needed to fill the team. You then send the invite to a group that you created earlier. Everyone in the group gets a notification allowing them to accept or decline your invite. When a member accepts or declines your invitation, you are notified. You can add members who have accepted to you game. Your confirmation is sent to the players you added. You can use this tool effectively to fill a team whether it’s a tennis doubles game, or a foursome at golf or players needed for basketball, soccer, volleyball etc. Once you confirmed number of players you needed, matchmaker goes to closed state. Polling, broadcast, and Email are three types of supported group communications. Members and administrators can use Polling to get quick yes or no responses from specific groups. Members and administrators can use Broadcast to send out announcements that need quick attention. Publisher of the broadcast message can visually see who has read the message. This way, they can notify members who have not seen the message by alternate means. When Broadcast and Polling are not the right choices for communication, you can also email members directly from the app. Team captains notifying their team about match or practice cancelations. Moderators of drop-in games sending confirmation or cancelation notice for drop-ins. Coaches sending class cancelation notice to their students. Team captains soliciting team player feedback for availability for an upcoming game. Moderatorssoliciting feedback for drop-in play. Club administrators requesting member feedback about a recent club change. Coaches requesting student’s confirmation for an upcoming class. With the app organizing events at club is so much easy and fun. 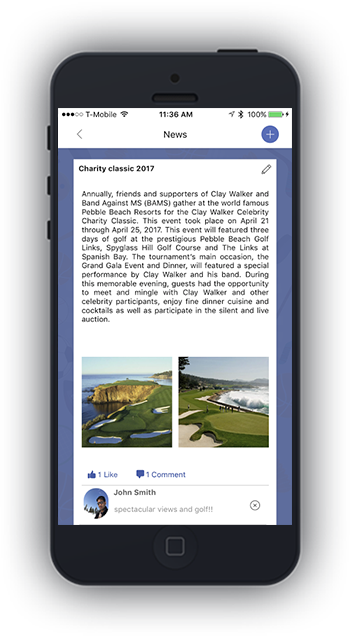 Whether it’s a club tournament, fund raiser or a social gathering, club can organize that event keeping all the participants promptly informed and updated. Administrators can create and publish both private and public events. Public events within a club are open to all members. Administrator and moderators of events can directly add participants to private events. Administrators can use communications to notify members and participants of the event. Participants can report scores if it is a scoring event. We currently support scoring for tennis, badminton, racquetball and squash. We will be adding scoring for more sports in future releases. When you are running a club it’s all about engaging members and keeping them updated about happenings at the club. We are in the social media era. And club members must not be left out from this. Mass emails sent out often go to spam folder or never get read. We have built Facebook style news feed into our app to deliver news to members in an effective way. Club administrators can add pictures and video links or simple text feeds. Members can like or comment as it’s in Facebook. Pictures posted can be saved to your phone. The directory allows members to search and find other members of the club. Users can also view member profile that has been publicly made available. If the users have chosen to hide some fields, those fields show as hidden. Users can easily create groups, selecting from the filtered results. Club administrators can manage members (add, edit or delete)in the directory. This is where members and administrators of the club provide details about themselves. You can turn or off what others can see on your profile through privacy options in setting section. You can also connect with your Instagram to showcase your latest Instagram pictures. Provide your contact details like phone number and email. Members can call / text / email other members quickly by visiting their profile. This section lets coaches of the club share their calendar to members, so that members can book lessons with them. Members can book lessons with their favorite coach. Lessons are added to their in-built on phone. 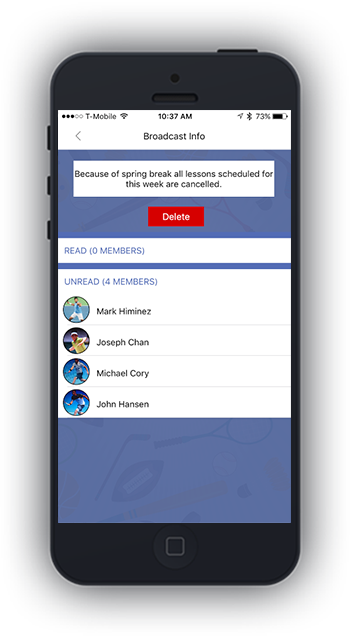 Coaches can block book or recursive book their calendar based on their availability and lessons. Confirmation notifications are sent any time a member books a lesson or cancels a lesson. This is where members and administrators change and customize certain features of the app. Change your password or logout from the app. Club director can manage club admins, club logo and club status message. 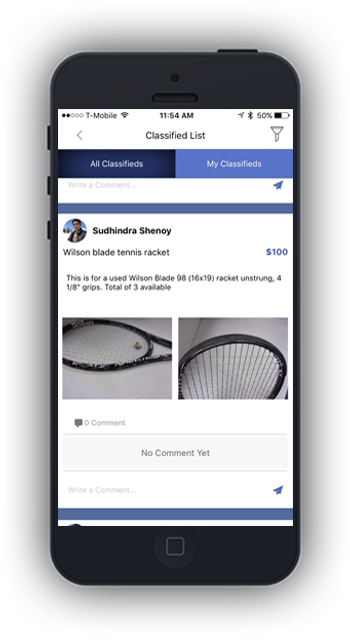 Classifieds enables club members and admins to advertise sports merchandise. Buying and selling sports equipment, shoes and apparel within the club community becomes so easy with this feature. Add pictures from the camera or gallery. Comment classifieds to ask question. Filter ads by keyword and price. Contact the member who posted the ad visiting his profile. Members can see all their notifications here. If you don’t want to get notifications turn them off in settings. But if you want to receive updates from the club and match maker invites please keep them on. Some notifications like match maker requests and polling you can respond by simple click. Our app offers simple ways to create recurring class and manage its schedule and participants. Members can sign up for the class with a couple of taps on their mobile device. Create recurring classes with time and schedule for recurrence. Manage and communicate with participants. Simple signup and withdraw options for members. League captains can also create a schedule for a league and get availability from his team for all the matches in that league. Create a league schedule and get availability from all the members of the team. Team members can send email or notifications to team members from the league page. Over all member experience will be enhanced giving the club better rating which will eventually increase the membership count. Clubs don’t need a full time front office employee to answer a phone calls now. Most phone calls are related to reservations, weather conditions check during bad weather, or getting signups for lessons and events. Club director can definitely save a lot of time that he can use for teaching more lessons increasing his income. Clubs can run promotions on lessons though news feed which will increase lesson signups. Running sales through the app adding news feed or broadcasts can increase the merchandise sale at the club. Members will know about upcoming events, classes better and participation in these can increase generating more revenue to the club. Club can bring advertising revenue by adding advertisement to news feed from local businesses or sports merchandise vendors, which could be substantial. Coaches and team captains can manage their students and team easily. 1) Basic Package is FREE on website only, without app support. 2) Communication package can accommodate 3rd party websites for reservation. 3) Monthly reporting feature available to capture charges on a per visit basis. 4) Discounts available for Academic and non-profit organization. Please enquire. Can you provide the app look and feel so that it looks like it is from our club? Yes, we can definitely make our app released in app stores as a new app meeting your specific needs meant for your club with some development fee. Please contact us with your needs. Which sports club can get benefited with this app? Any sports club could be greatly benefited with this app. Our reservation system is very much customizable to match you needs. All our features are applicable to any sports club that is looking to take advantage of cloud based mobile technology for their benefit. We have some tennis courts that have lights and some don’t. So reservation timing changes for these courts based on day light changes. Can the app take care of this scenario? Yes. Make use of recursive booking. You can block certain courts for certain time of the day from getting reserved. You can recursively block from 1 week up to 6 months. Change these settings based on the day light conditions. I am a member and why can’t I upload videos or pics in the news section? Your club has decided not provide this feature to members to avoid administrating posts from members. Please send pictures and description to your club admin to create a post for you. I don’t see scoring for my sport, can you please add it? 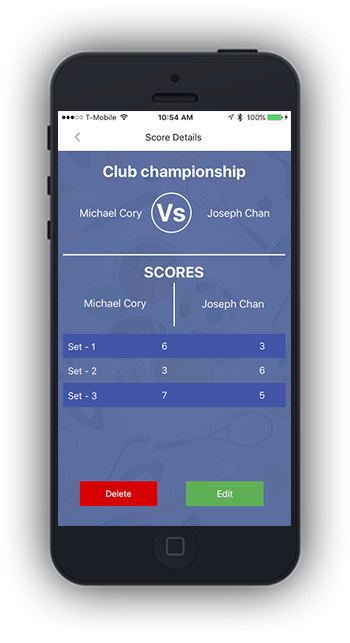 As of now our app supports scoring for events for tennis, badminton, racquetball and squash. We will be adding scoring for other sports in the future. If you need scoring for some sports that’s missing on our app, please contact us. As club admins how do we avoid members making reservations and not showing up? Our software can keep count for “no shows”. When members book a court and do not show up admins can delete their reservation and report a no show for them. Club can penalize them if their “no show” count is above certain number. A decision club has to make. Software keeps count of no shows for every member. Why am I not able to message another member directly through the app? We intentionally did not provide private chatting, to avoid unnecessary messaging and to protect privacy of members. You can use Broadcasting and polling to communicate with other members. Visit member’s profile and you can send them email, call them or text them if they have not hidden their contact details. I am new to this club using your app. How do I send match maker requests to players with similar playing level as me? Go to member directory filter members with desired playing level and gender. Unselect the members you don’t want to play with. Then create a group with the rest. Use that group created in the match maker section. Please contact us with any question you have about our product, features or promotions.